Wait! Before we get started on this topic, hope you have read this book from chapter one? This is chapter twenty, you might not get much from today's lecture if you skip any of our previous lectures. But yes, it’s not that funny, in our chapter one lectures we explained the types of blog available, if you are building a company blog (e.g. blog.jumia.com.ng), then there might be little or no need to monetize your blog. On the other hand, if you plan on taking blogging as a part time or full time job just like me, then there is every need to earn money from your blog, even if you are just starting out, but please, don't be too quick to monetize your blog. 1. To get money for the upkeep of the blog; Blog upkeep Includes PC and mobile data subscription, domain and host renewal, making payments for traffic purchase (if needed), paying co-writers (if any) and other general maintenance Operations. 2. To put food on your table; Even if you initially joined blogging just for fun, it’s not an abomination to eat from where you work, in fact, it gives special joy making money doing what you love doing. 3. As a source of livelihood; you’ve heard that Linda Ikeji recently purchased a new mansion at the popular island right? Come on, we are not talking of making penny here, blogging pays, even more than blood money, yes, if you play by the rules. There are over 200,000 Nigerian bloggers making money from their blog daily, you want to be one of them right? No worries, I will show you how. It’s not a good blogging ethic to monetize your blog early, even before Google knows you have a blog, the time it takes to start monetizing a blog varies, it depends on the niche you choose, the average growth rate of your blog, the number of unique visits you get monthly, and the type of monetization option you choose. Blognigeria.com.ng started monetizing its content 3 months after it was launched, ngstudents.com started about a year after, it all depend on the time you get what it takes to monetize your blog. What Does It take To Make Money from a Blog. In other to make money from your blog, first of all, you will need contents, not just contents but quality content, some people will call it an evergreen content, a unique one, not a copy and paste content, something that will answer the questions of your blog visitors, an article that will solve their problems. In our previous lectures I have already taught you how to get contents for your blog, and how to write good viral articles for your blog. Getting your blog visitor’s trust is also what you must strive for, they have to believe that whatever comes from you is of value to them, I have already lectured you on how to build a great relationship with your blog visitors. Also, a Monetize-ready platform is needed, remember we told you that not all blogging platforms allows you to monetize your blog, we also gave you a comprehensive list of 15 blogging platforms and their features. 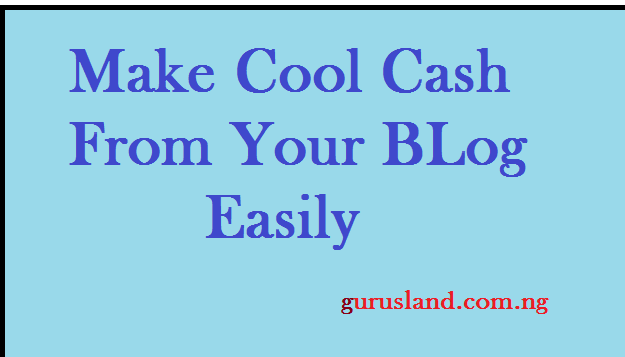 You will also need a good number of monthly traffic hits in other to earn something reasonable from your blog. I have taught you how to drive traffic to your blog in one of the previous chapters. What Is the Minimum Traffic Requirement to monetize a blog? Some media ads network will set a minimum daily hit you must reach in other to apply for a publisher's account, not all of them (AdSense and wordads don't, mgid do). In general, the more your traffic, the better keywords are optimized on your blog, and the more money you earn from your blog. Staring out with 500 daily page views is my recommended standards, even AdSense will accept that. In What Ways can I make Money from My Blog? 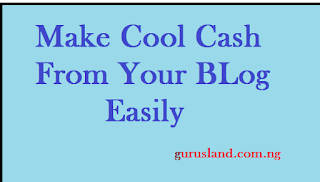 This is the easiest way of monetizing your blog’s content, all you have to do is register with an ads company, if approved, get your code and place it on your blog. The media formats available are; text ads, banner ads, video ads, pop up ads (comes up on the page), pop under ads (opens up in a new tab). You can choose any of them or a combination but it also depends on the media format made available by the ads company and your niche. We have many media ads network you can choose from, it’s left for you to test and select the ones that are more productive. Examples of media ads network includes Google AdSense, wordpress wordads, media.net, infolinks, adsthrive, chitika, mgid, propellar ads, ads optimal, dochase ads, revcontent, adsterra network, revenuehits, bidvertiseter, clicksor, popads, adcash, buysellads, etc. There are about a 100 of them. Some of them specialize on a specific media format (e.g. popads, for pop up ads), some of them are specialized on a targeted region (e.g. media.net for UK and US mainly), you will also find out that some of them are more productive on a particular blog niche. In General, It is left for you to test and choose which of them pays better for your blog’s content. Don't worry, how to choose the best ads network for your blog will be a lecture topic of chapter twenty one. As your blog grows, interested companies will start sending you mails, requesting to advertise their product or service on your blog, this is better than the normal media ads network because there will be no middle man to cut the cake, just you and your client, it is also a better choice for the company because direct ads can’t be blocked by visitors using ads blocker in their browser. For example, Linda Ikeji sells one direct banner space on her blog for 250,000 per month as at 2015, that's better than what Google AdSense could offer her, though she uses both Google AdSense and direct ads to monetize her blog. Big Forums like Nairaland don't use adsense or any other ads network, just direct ads, because they have made their name and earned a good reputation online. BlogNigeria.com.ng uses a combination of direct ads and media ads network also, but for the start, it have to be a media ads network. This is another great way of monetizing a website. Here you register with a company that rewards for affiliate sales, you will be given a URL or HTML code to place on your site. You have to choice of choosing the product you want to sell for them. Whenever any of your blog visitors purchase their product using your link, you will earn a percentage (usually around 5 to 10% per sales). Some companies that offer affiliate advertising include, Amazon, EBay, etc. All Hosting providers such as siteground, godaddy, bluehost, dreamhost, hostgator etc. engage members in affiliate programs. All online shopping Platform such as jumia, konga, jiji, OLX, etc. also engage members in their affiliate programs. Take Note, The products of the affiliate company must be related to your niche, otherwise it will not be productive, for example, if your niche is on "web Hosting review", applying to sell women clothes from jumia on your blog will be a waste of time. That's not how it work. Blognigeria.com.ng also earn from this source. Here, a company or website will contact you to write a post about their product and publish it on your blog, the price will be left for you two to decide. Digital products are intangible products such as eBooks, apps, themes etc. But the most common is eBook, you can organize about three or more of your related posts into an eBook in a pdf format using a doc to pdf converter; search on Google for that, then sell it to interested members. An average eBook can sell for $10 or more, even up to $200 depending on the content, you can also sell your eBooks on Amazon and eBay. Remember it’s in unlimited supply. You think blogging is only about writing and publishing right? Wrong, many successful bloggers manufacture physical products mostly books, “How To" guides, they even organize seminars and live forums, as a blogger who intend to earn a living from blogging, you should think outside the box. Not all of the above mentioned platforms will work for your blog, maybe two or more depending on your country and blog niche, there is no harm in trial, test and see for yourself, all of them are free for the trial.